The berry share kicks in at the beginning of the summer. 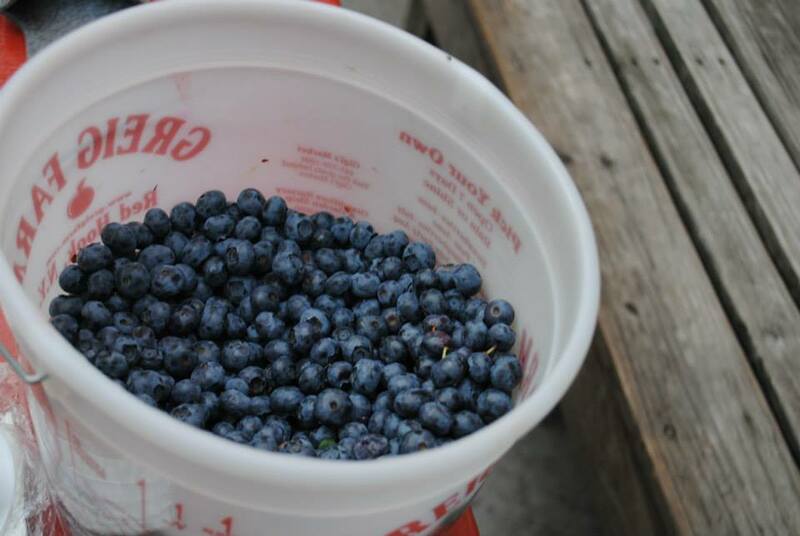 Each week, we receive *buckets* of fresh blueberries, strawberries, raspberries, and blackberries. Due to the quantity of fresh berries we end up freezing a lot of them. 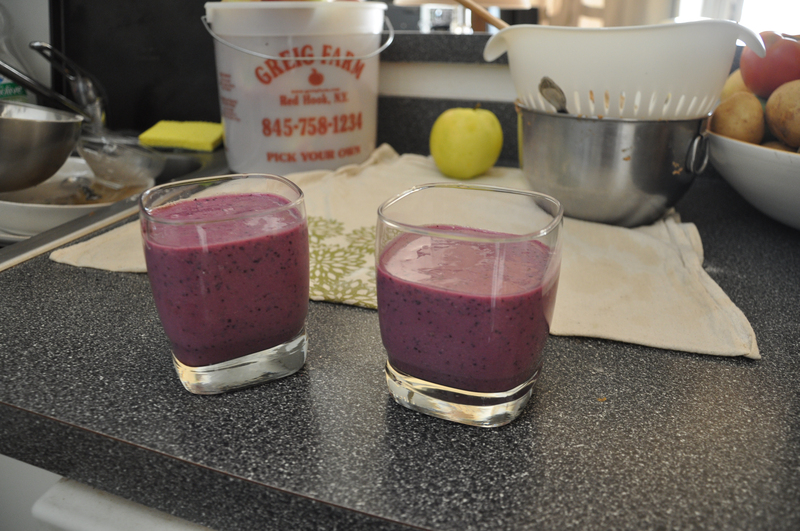 But whenever we’re in the mood for a smoothie, we are ready to go. Throw it all in a blender until you can no longer see white from the tofu. Pour into a glass and let the good times roll. 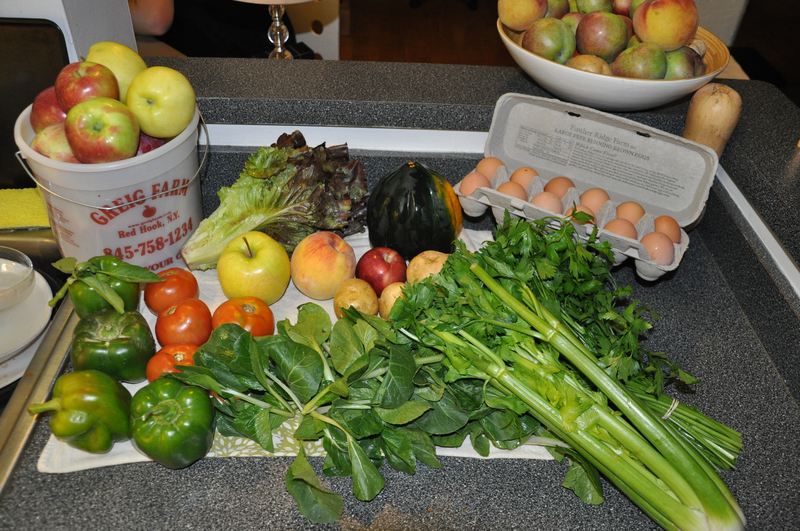 This week’s share included a bucket of apples, peaches, dozen eggs, bell peppers, tomatoes, green lettuce, potatoes, celery, squash and loose bok choy. As I unload the share, I typically wash everything before going into the refrigerator. At the same time, I conjure up recipes for the week. Three medium sizes potatoes, sliced into 1/4 inch pieces, tossed in olive oil, salt and pepper with chopped parsley leftover from last weeks share. 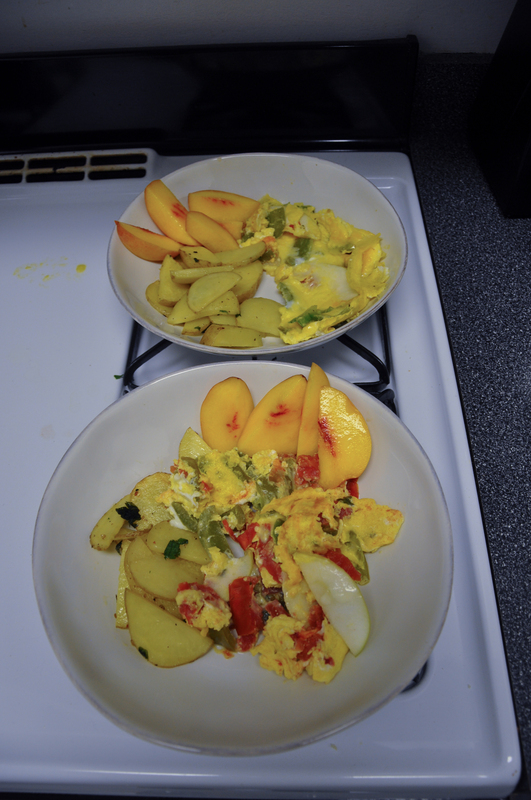 Into a frying pan on medium heat, until the potatoes are browned on both sides. In a separate pan, combine one chopped green bell pepper and one tomato with a diced jalapeno (leftover from last weeks share). On low heat, saute the three ingredients with a bit of olive oil (about 6-7 minutes). 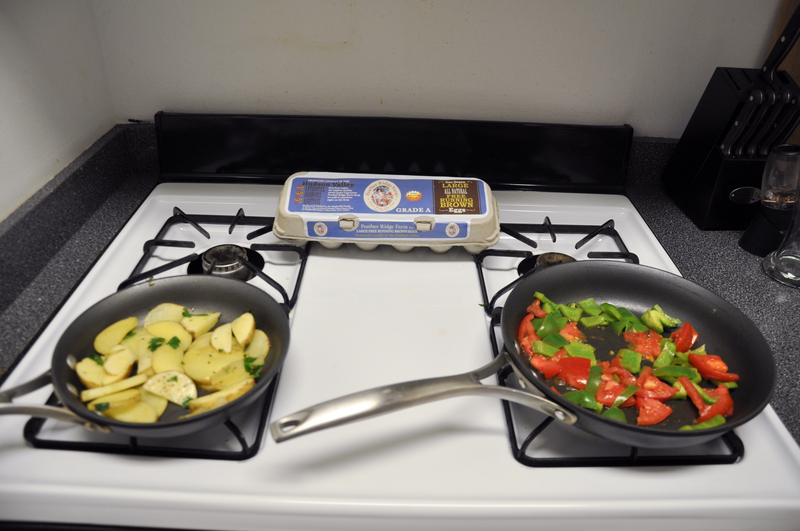 In a bowl, whip together 4 cracked eggs and add to the pan once the vegetables are cooked. 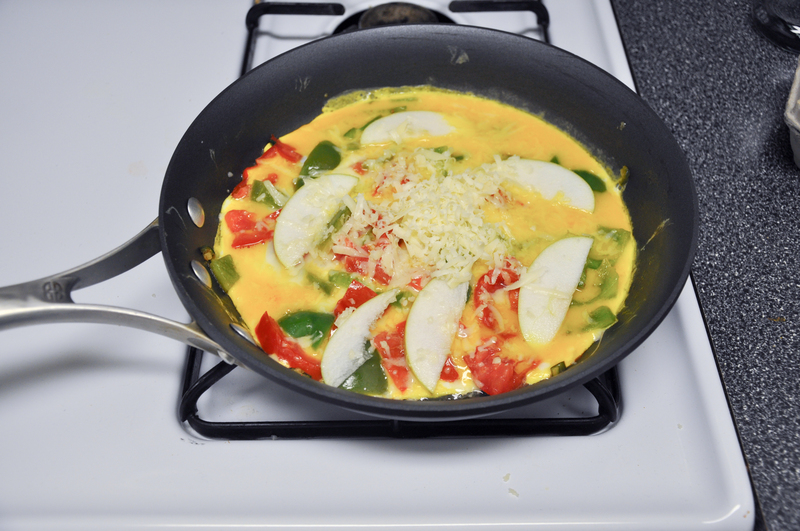 Lower the heat, add sliced apples and shredded pepper jack cheese to the top. Cover with a lid and allow the cheese to melt. 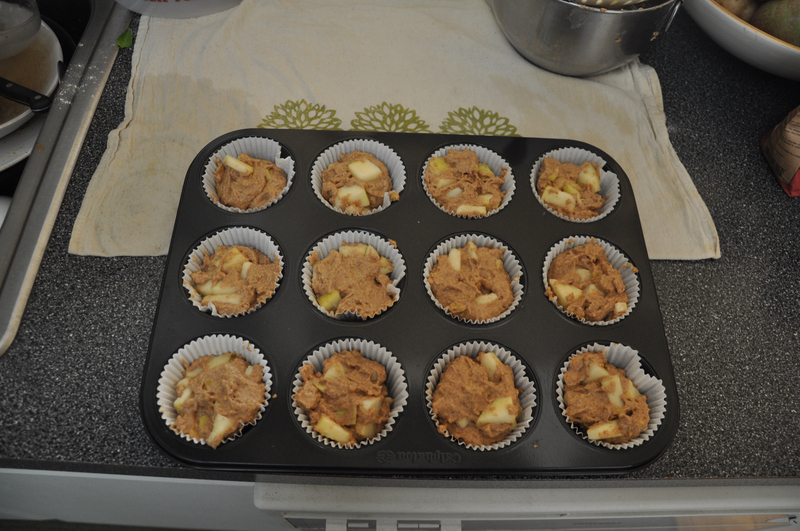 After 3-4 minutes the apples soften and the cheese is fully melted. Start by preheating the oven to 400 degrees. Lightly grease a muffin pan or use liners. 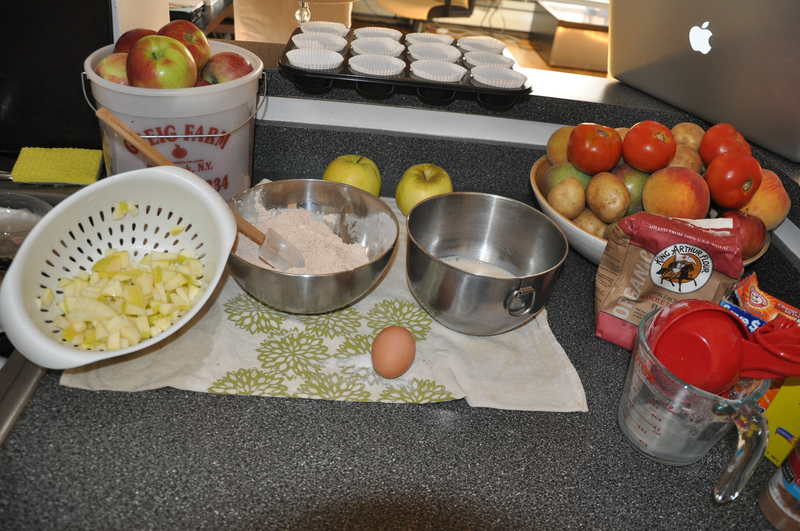 Stir together the dry stuff first (flour, baking powder, sugar, nutmeg, cinnamon and salt). In a separate bowl, stir together the wet ingredients (milk, egg and butter). Combine the two by stirring the egg mixture into flour mixture until they are combined. 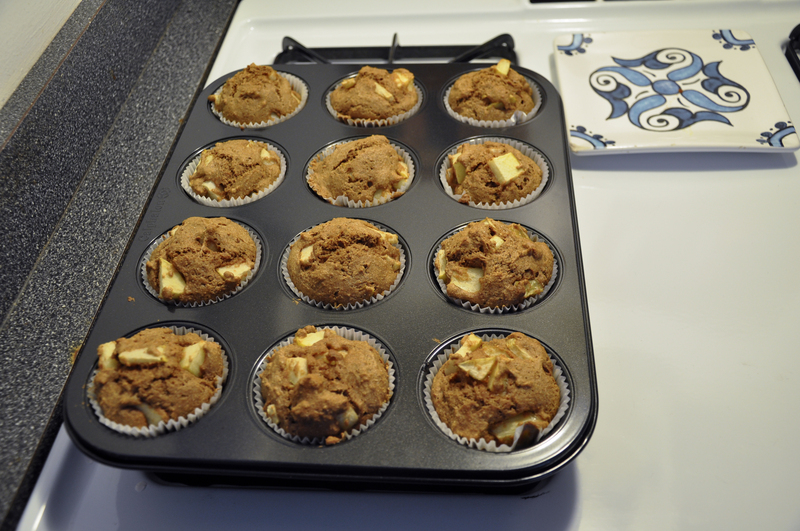 Mix in the apples Spoon batter into the muffin pan. Bake for 20 minutes. Let them cool for a few and then enjoy!